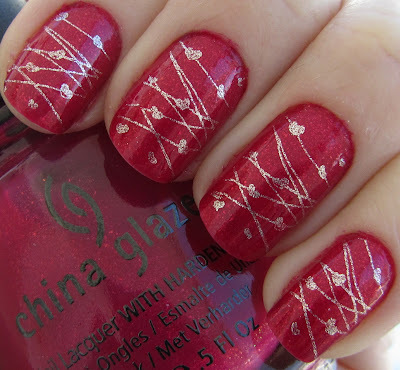 Polishology: Valentine's Day with Ahoy! 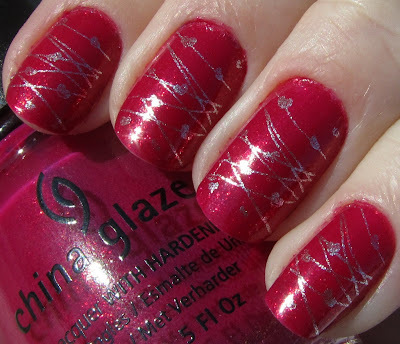 Here is a Valentines' Day manicure the I did with China Glaze Ahoy!, a gorgeous bright magenta polish full of shimmer. This is three coats of Ahoy!, all of which I found necessary to cover up VNL. Smooth application and good dry time on this one. I love this polish - it is a beautiful pink and that shimmer is pretty much always really sparkly (even if it is hard to tell in the photos)! great mani with simple tiny lines i love it! I just put Ahoy! on my toes and I love it! I'm so glad I picked this one up - it's so pretty! this is pretty!!!! love it! super dulce y delicada!! me encanta!! !